The Ache-No-More pillow with stress reliever helps to ease tension in neck, back and shoulder areas as it corrects alignment of the spine and back. This unique pillow addresses painful neck and back pain caused by improper head and neck support. 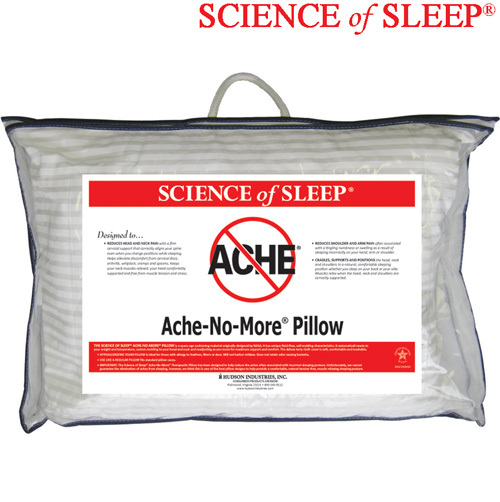 The Ache-No-More® pillow is designed with a firmer cervical section to fully support the neck while reducing pressure and tension on the shoulders and arms. A soft foam top helps to gently cradle the head for a more comfortable nights sleep. Soft urethane foam cover fits standard pillowcases. Size: 15.5" x 20".